But seriously, Valentine's Day is for lovers!!! So, I've come up with my own advent calendar designed especially for you and your love! This is mine on our bedroom wall...that way nobody else sees it (except you, of course)... And if you have kids, you want to keep it seperate from anything Valentiney you're doing for them. Each day has some kind of simple romantic activity or guesture that you both do together (or maybe seperately). The possibilities are endless, but you can read the activities I used on my cards below. And.... of course I have some purchase options for you if you're interested in making this project a little easier on yourself! Set of 18 Printable Cards (15 options above and 3 blank) and Numbers 1-14 in PDF format (using the cute font I used on my envelopes). No custom options. 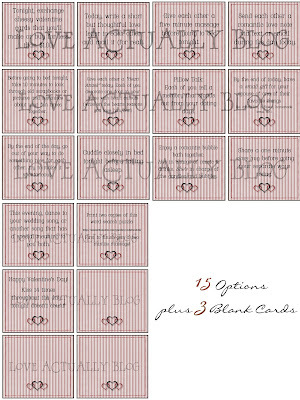 Customized set of 14 Printable Cards. You provide the wording and I'll make the cards for you. Also includes numbers 1-14 on a PDF (using the cute font as on my envelopes). Email loveactuallyblog @ hotmail.com and tell me which option you'd like! Note: Purchase includes digital items only. No product will be shipped. Be sure to check out Love Actually's "Love Checks" on sale now! I'm so glad I found your blog! Thanks for sharing your cute, creative ideas for those of us lacking on ideas!! Did you tape them to your wall? Yes. just used scotch tape. Hey Girly! YES...I am LOVIN' your blog! I am glad you like what I did with your idea! You are SO stinkin' creative! Keep 'em coming! I am loving SOOOO many of your date ideas! My friends & I are starting up our OWN "date blog" ....that was supposed to be JUST for us, but the more friends & family that find out about it...want to be readers, so we will be making it public. One of my friends who wil be an author is a reader of yours and told me about YOUR blog! Great minds think alike!! I would NEVER have known about you if we hadn' decided to start this up!! Most of us are on tight budgets or have husbands still in school.....SO....we will be taking turns coming up with creative weekly dates that will be posted on our blog. You've already turned a few of my "potential ideas" into dates! I am LOVIN' your massage one, and the super bowl one, and that feature on the Amazing Race....SO FUN! I totally want to do that! Anyway, we will be starting the week of Valentine's....fingers crossed....and I am SURE we will be referring to your blog! :) We may have to collaborate in the future! i love all of your fun ideas! being poor dental school students, i love all of your blog :) thanks!! Ok... so I've recently joined this craze of all these fun creative blogs.. but never commented on any of them yet. But I tried this idea - my husband saw it today at lunch and got such a great smile. I can't tell you how much tighter his hugs were and longer his kisses were for the rest of the day! And we are only on day 1! thanks for the help! I did one for my husband and I. But I didn't have the really cute paper like you. Just stopping by to say that this was a great idea. 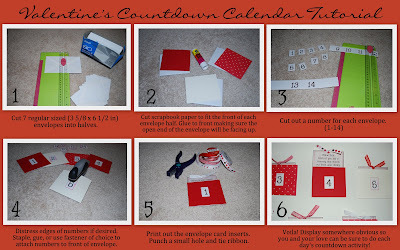 I created my own Valentines Day Countdown calendar, borrowing ideas from here (see mine at www.pinkcombatboots.wordpress.com) and looking forward to it this year. This was so dang cute!! Those were some awesome ideas. I wish I had found it sooner!! I hope you don't mind, I posted it over on my blog! www.myyellowsandbox.blogspot.com, I'd love for you to come follow along if you get a minute!! You're blog is so super cute and I don't even know how I found it, but I'm so glad I did! !